If you haven't played along yet, there's still time! The entry deadline is September 29 at noon CST. The challenge winner receives a $20 Reverse Confetti gift certificate. 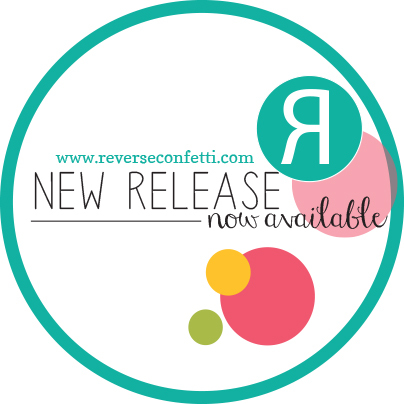 Head over to the Reverse Confetti blog for challenge inspiration from the Confetti Crew. The yellow circle was from my leftovers bin. 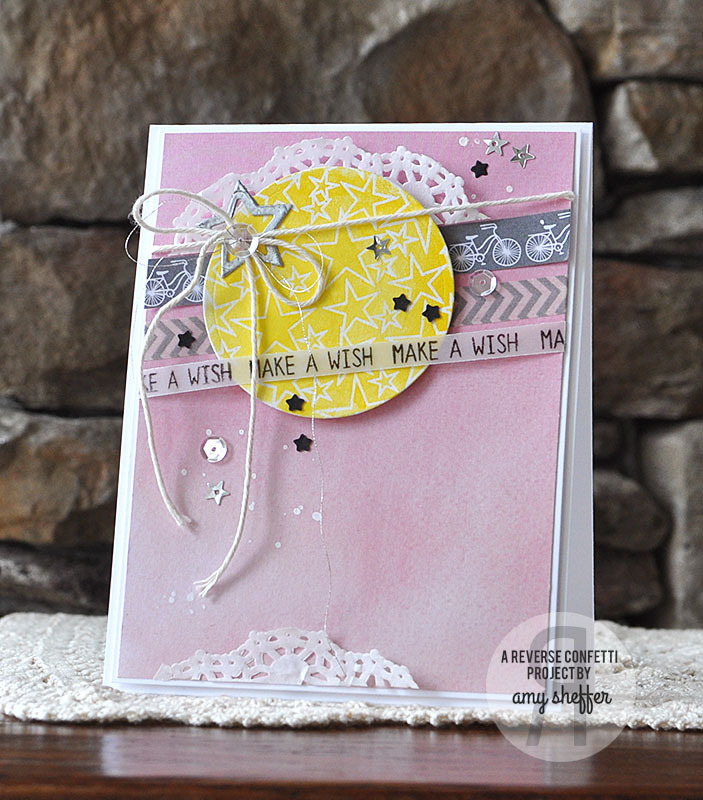 It's a piece of watercolor paper stamped with Reverse Confetti's SO MANY STARS, heat embossed, and then watercolored in yellow and die-cut with one of the circles in the CIRCLES 'N SCALLOPS CONFETTI CUTS die set. "Make a wish" is from one of the sentiments in IN A BIG WAY. I just did some selective inking to isolate that portion of the sentiment. The background paper and the bicycle strip are from Dear Lizzie's Daydreamer collection, and the gray chevron strip is washi tape. I wanted a more random, collage-type look, so I added some bits of doily, some white ink splatters, silver thread, and lots of sequins and tiny stars (die-cut from the STARS PRETTY PANELS CONFETTI CUTS). 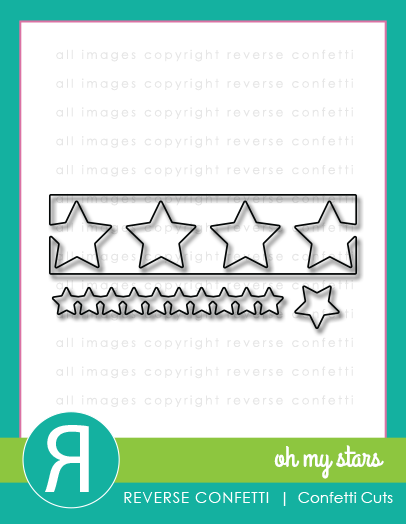 The silver embossed star accent was done with OH MY STARS CONFETTI CUTS. 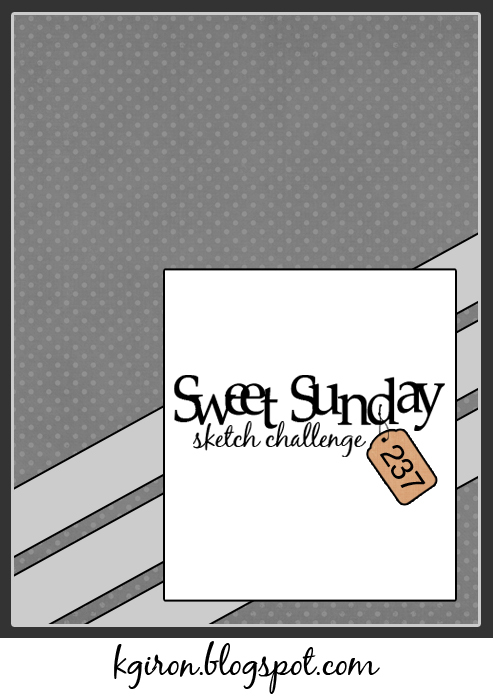 The layout is adapted from this week's Sweet Sunday Sketch Challenge. I just swapped the rectangle for a circle and turned the whole thing upside-down. Last night, I attended my fourth back-to-school night for this school year, and have been feeling especially grateful for the fabulous teachers and staff at both of the schools my children attend. This card is to honor all those who choose education as their profession. A+ for you! Some of the fun details on today's card are thanks to my Curtain Call teammate, Sheri Gilson. Some of the Curtain Call girls decided to do a product swap, and Sheri drew my name. Check out the awesome loot she sent me! 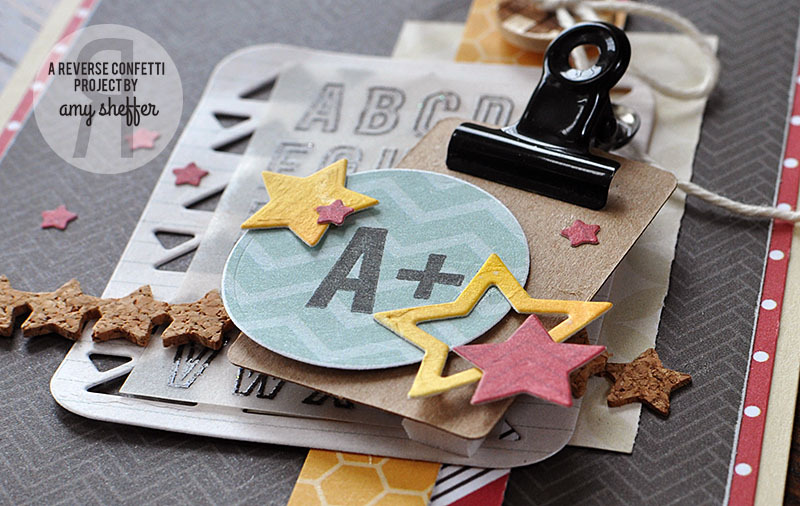 I love everything, but especially the chevron embossing folders. 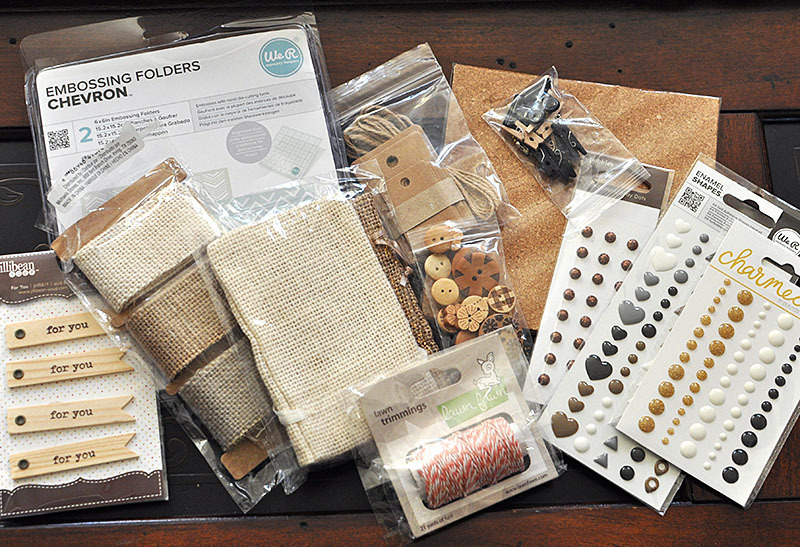 I've been wanting to add some new folders to my stash for a while now, so these were perfect! 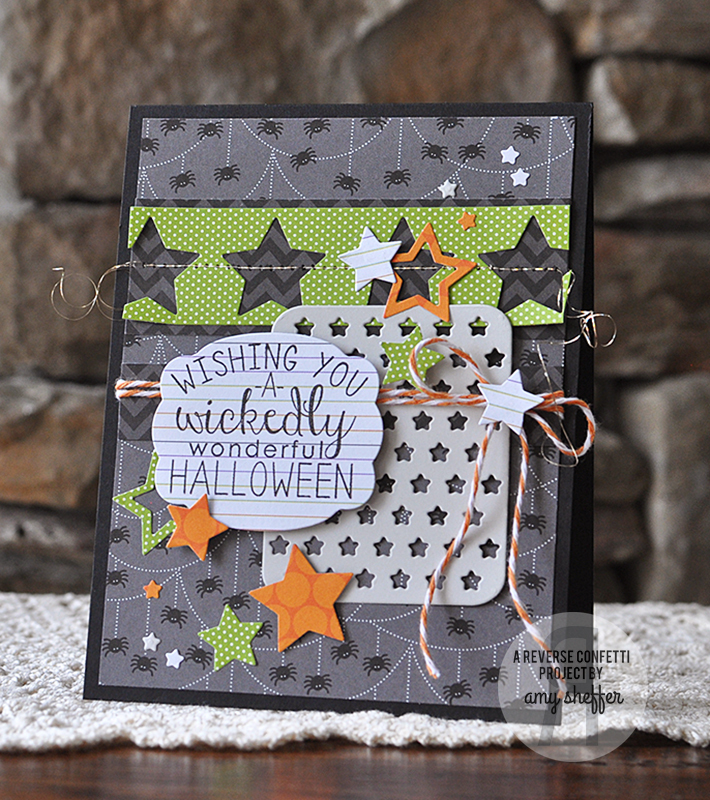 You can see one of the embossing folders in action HERE. For today, I combined one of the binder clips with a rectangle chipboard tag to look like a clipboard. I die-cut the tiny star border out of the adhesive-backed cork. I also added a plaid-patterned wood button. Thank you, Sheri! This was like Christmas!! I enjoyed pairing some old and new REVERSE CONFETTI products, too. 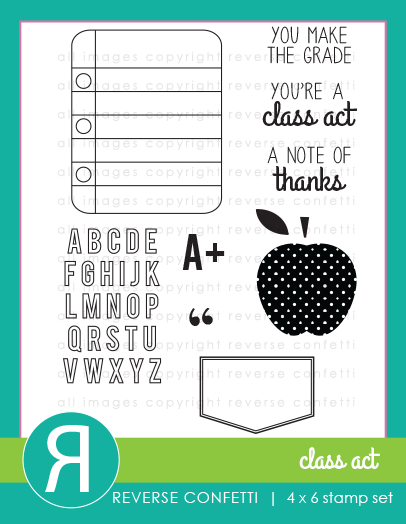 CLASS ACT is an obvious for any school card. Two new Pretty Panels dies make an appearance as well. The notebook paper panel is cut with TRIANGLES PRETTY PANELS CONFETTI CUTS, and the tiny red stars are the cut-outs leftover from the STARS PRETTY PANELS CONFETTI CUTS. 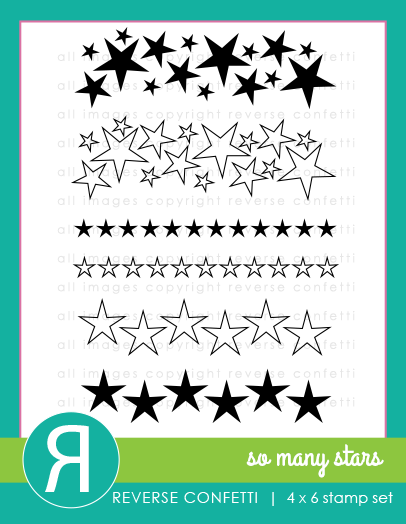 The other larger stars were done with the OH MY STARS CONFETTI CUTS. 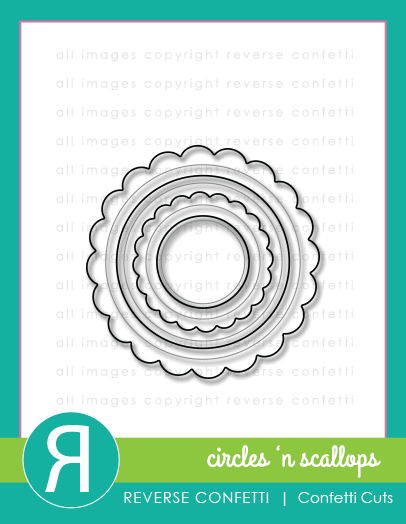 The A+ fits perfectly in the smallest circle from the CIRCLES 'N SCALLOPS CONFETTI CUTS. Hello, gorgeous! Have you played along with the current Curtain Call Wishing Well challenge? Challenge entries are due September 25 at 8 am CDT, and a randomly chosen participant will win a $25 gift certificate from our generous sponsor, Whimsy Stamps. 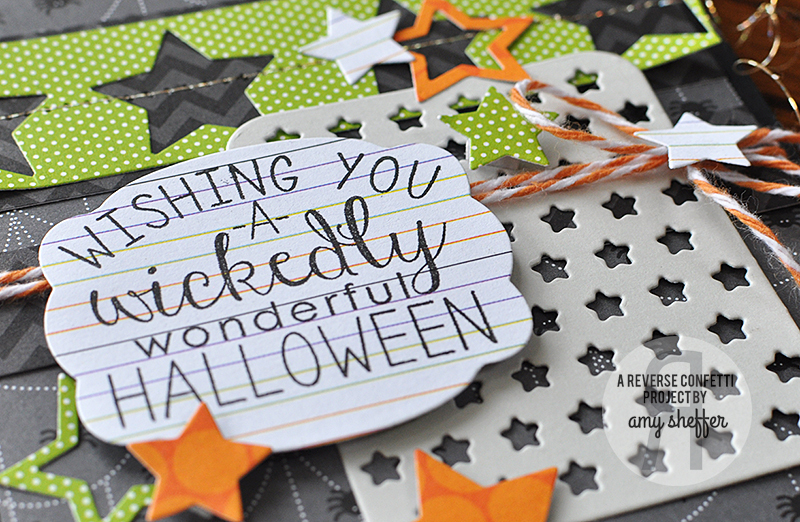 Be sure to check out the Curtain Call Inspiration Challenge blog today for round two of challenge inspiration. For my card, I drew inspiration from the colors, as well as from the stones. I started by sponging a circular area of the background in green. Around that, I created a stone background texture using a stencil and some texture paste. 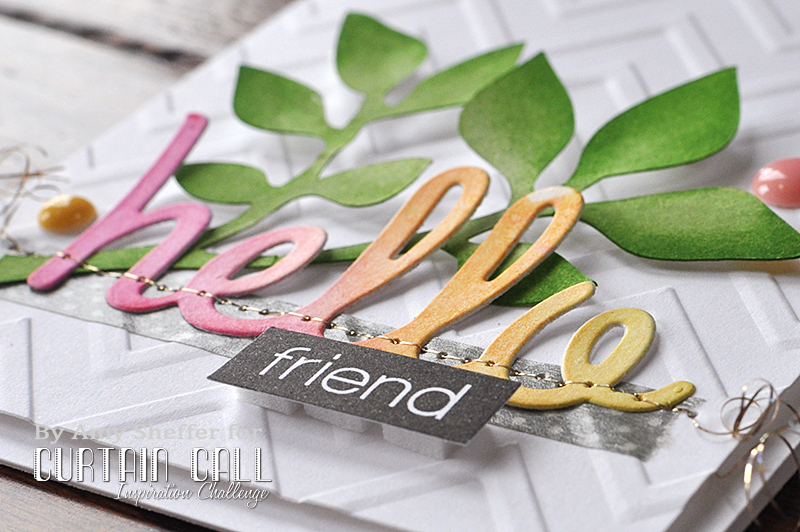 I die-cut the word Hello using the HELLO LARGE WORD DIE by Whimsy Stamps from a leftover piece of a watercolored and spritzed background - the colors were perfect for this challenge. 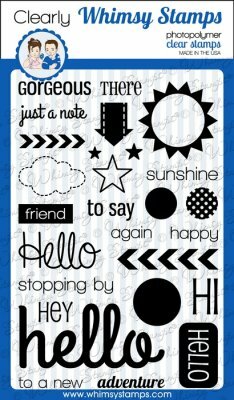 The word "gorgeous" is from the HAPPY HELLO stamp set by Whimsy Stamps. A thread nest, sequins, and a washi tape border along the right add the finishing touches. 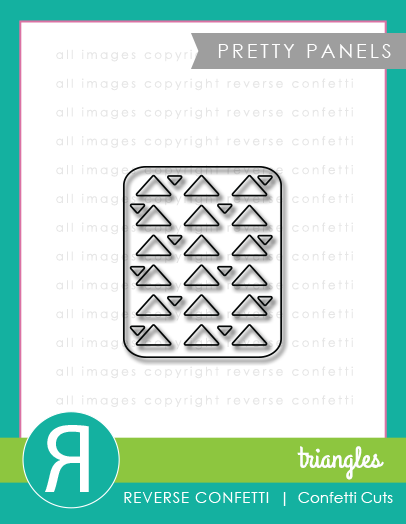 REVERSE CONFETTI is sponsoring a sketch challenge over at Stamp Nation. 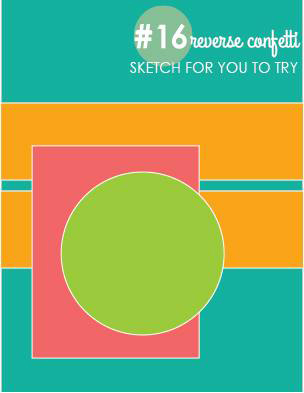 The sketch is a super fun one! 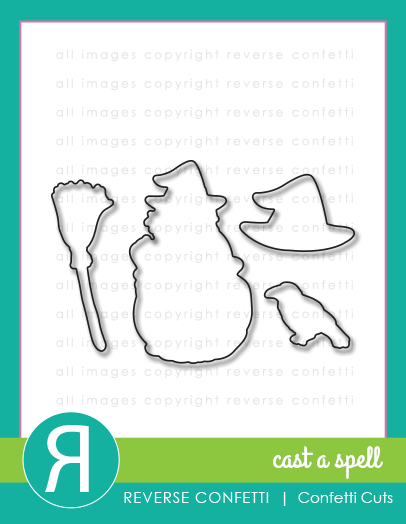 Here's a little peek at what I put together for the challenge, using Reverse Confetti's CAST A SPELL stamp set, as well as CAST A SPELL CONFETTI CUTS, CIRCLES 'N SCALLOPS CONFETTI CUTS, and PRETTY PANELS STARS CONFETTI CUTS. To see the sketch challenge, along with loads of inspiring sketch samples from both the Stamp Nation design team and the Reverse Confetti design team, head over to Stamp Nation. If you're not already a member, right now, Stamp Nation is offering a $1 trial membership (but hurry, the offer expires today!). Join a thriving community of stampers and enjoy access to hundreds of instructional videos, challenges, message boards, galleries, and so much more! 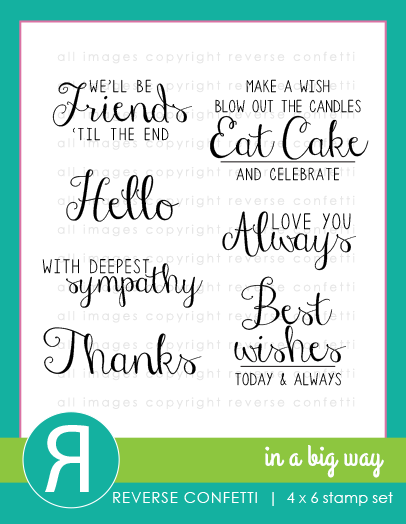 We have a wonderful new sponsor, Clearly Whimsy Stamps, for the Curtain Call Inspiration: Wishing Well! 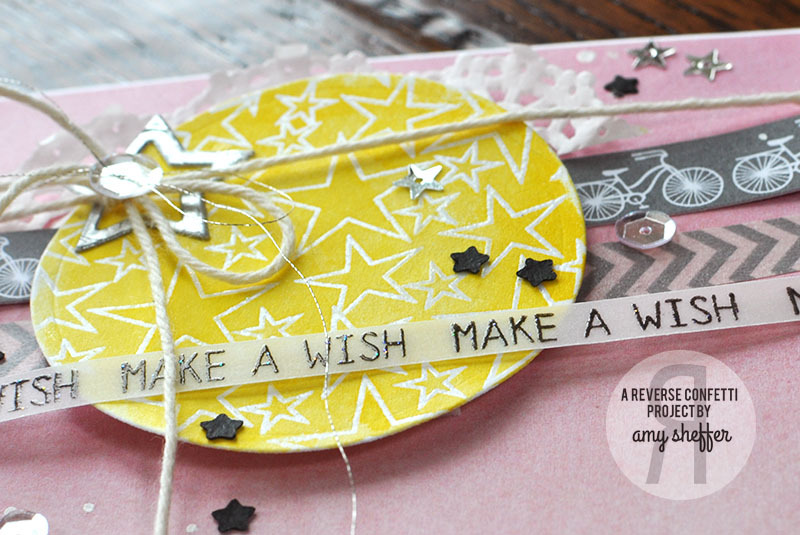 A randomly selected participant in the Wishing Well challenge will receive $25 store credit to Whimsy Stamps and the LEAD will be invited as Guest Designer of a our next challenge! I started my card by watercoloring a scrap of watercolor paper in the pink, orange, and yellow colors of the flowers in the inspiration photo. Out of that, I die-cut the word "hello." The leaves were cut on my Silhouette and sponged with different green inks. I dry-embossed the background with a new-to-me folder, a gift from my fabulous teammate Sheri Gilson, then added a strip of washi tape before stitching down the leaves and word die-cut with metallic thread. I stamped the word "friend" in black, trimmed it down and popped it up on foam tape, then added a few enamel dots to finish things off. 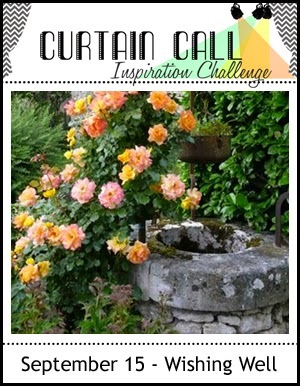 Stop by the Curtain Call Inspiration Challenge: Wishing Well for the challenge details and to play along with us! Hello, friends! 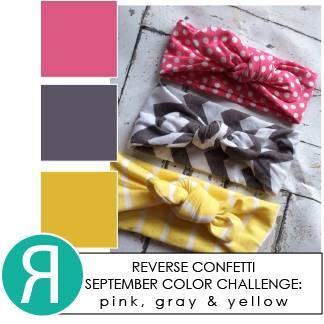 Just a friendly reminder that there's still time to play along in this month's Sketch For You To Try challenge over at Reverse Confetti. Some of the Confetti Crew have posted sketch samples today. 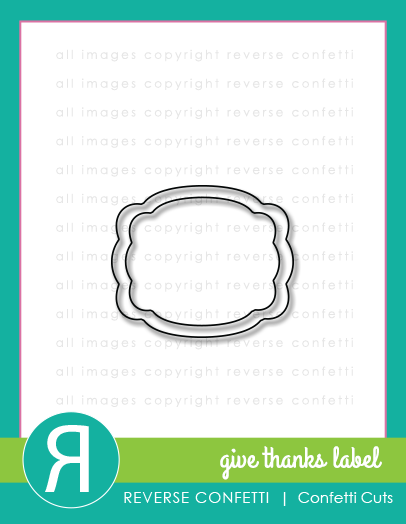 Check out the Reverse Confetti blog to see all of them and to link up your sketch creation. The deadline to participate is noon CST on the 14th. A $20 gift certificate and "Fetti Fave" title are up for grabs! 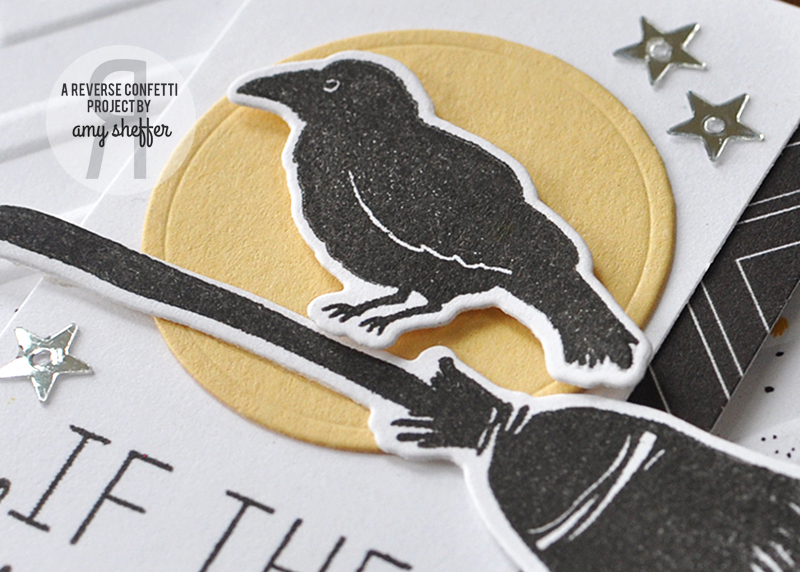 I combined some fun shiny new and not quite new Reverse Confetti products today. 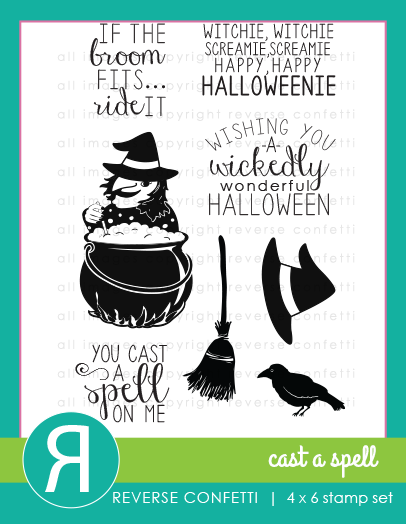 The sentiment is from the new CAST A SPELL stamp set and has been cut into a label shape using the new GIVE THANKS LABEL CONFETTI CUTS die. The panel with the tiny star cut-outs, as well as the tiny stars sprinkled around here are there, are from the new PRETTY PANELS STARS CONFETTI CUTS die. 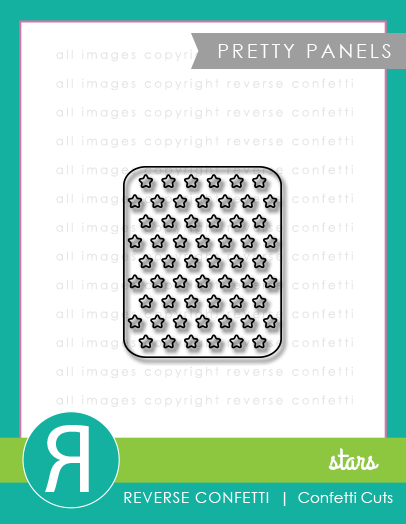 The star border along the top, as well as the larger scattered stars, are from the OH MY STARS CONFETTI CUTS die set.